We are delighted to bring the award winning Nomi Highchair by Evomove to the UK. The Nomi Baby recliner can be used from birth until the child can sit up unaided. Brings your little one to eye level and lets him or her take part in family life, while the parents can benefit having their arms free. Seamless adjustment from almost horizontal to more upright positions. When in the almost horizontal position, the weight of the child is distributed across their whole body. Slightly bouncy, yet always keeps the baby’s head stable. Nomi Baby has a 5-point safety harness. Nomi Baby is an accessory which fits the Nomi highchair and can be purchased in several colours and fabrics. 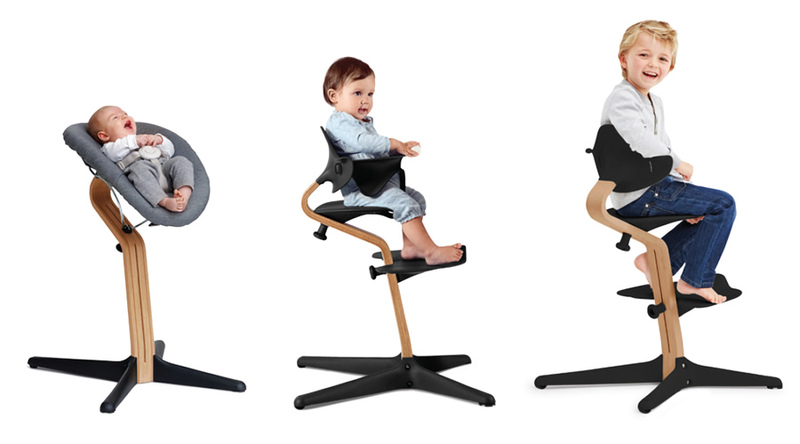 The Nomi Mini is to be used when your child can sit unaided. Nomi is designed to be used at the dining table, enabling the child to sit actively while taking part of the family life. However, in certain situations a harness or a tray can be a valuable accessory. Remove Nomi Mini once the child can climb up and down unaided. Adjust the seat and footrest seamlessly as your little one grows. The shape of the stem ensures automatic correct ergonomic adjustment of seat and footrest depth. The open design inspires free movement and makes it easy for the child to get up and down and pull in towards the table. Nomi Highchair can be purchased in several colours and wood finishes. Peter Opsvik has designed Nomi – and numerous other classic chairs that are currently used in offices, living rooms and kindergartens around the world. During the past decade he has received several Nordic and international design awards for his sitting solutions for children and adults. More than anyone, this Norwegian designer has reflected upon the way humans sit. So that the human body becomes the core of good design and we can better unite our sitting lifestyle with our active bodies. Nomi is the result of more than 40 years of work with children’s chairs. Peter Opsvik has designed Nomi from the philosophy that children need a stable platform from which to move – a platform that inspires many different positions, so the child can sit safely and with free mmovement.